Full spectrum of electrolytes, plus UltraMag® magnesium. Coconut water base for natural hydration. The ultimate sports rehydration formula - coconut water with a specific electrolyte composition and UltraMag® a unique blend of magnesium chelates. This formula assists with rapid replacement of fluid and electrolytes and supports energy, stamina and endurance. 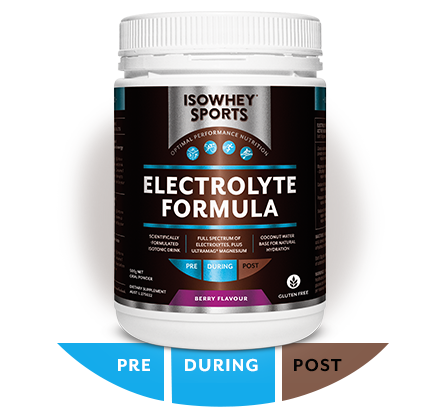 IsoWhey Sports Electrolyte Formula also assists in relieving muscular aches and pains and in preventing muscular cramps and spasms. Coconut water is a naturally rich source of electrolytes potassium, sodium, calcium and magnesium, vitamin C, B6 , folate, iron and phosphorus. • Scientifically formulated isotonic drink that delivers a unique blend of coconut water, carbohydrates and electrolytes to support healthy hydration and energy production and the maintenance of peak condition during strenuous or endurance exercise. • Provides a full spectrum of electrolytes that are lost during intense exercise – sodium, potassium, magnesium and chloride – for rehydration and helping the body's fluids stay in balance. • Has a coconut water base that supplies protein, carbohydrates and electrolytes to support natural hydration. • Contains UltraMag™ magnesium, a specialised delivery system that enhances absorption and intestinal tolerance of magnesium, to reduce muscular aches, pains and cramps. • Provides 4% carbohydrate per isotonic dose to provide a rapid delivery of fluid and fuel, and maximise gastric tolerance and palatability. • Contains 4200mg of malic acid. • No artificial colours, flavours or sweeteners. Mix 1 dose (2 level scoops =30g) into a 600mL bottle of water, shake and drink 30 minutes prior to exercise. Consume 1 dose during each hour of exercise up to 4 doses per day, or as directed by your healthcare professional. Mix 1 dose (2 level scoops =30g) into no less than 650mL of water. Consume up to four doses daily or as directed by your healthcare professional. Mix 1 dose (2 level scoops =30g) into no more than 450mL of water. Consume 1 dose three times daily, 2 to 3 days before an event or as directed by your healthcare professional. INACTIVES: Maltodextrin, glucose, L-malic acid, steviol glycosides, silica, collodial anhydrous, natural berry flavour, acacia. Each 30g dose provides approximately 21.5g of carbohydrate. If symptoms persist, consult your healthcare practitioner. Contains 13.5g of glucose per dose. Contains 1.2g of sodium per maximum required daily dose.